HAZOP studies are aimed at serving companies that wish to protect themselves against risks – particularly companies in the chemical and process industries. However, the conventional method addresses the modern challenges of today only to a limited degree. Rainer Semmler from TÜV SÜD Chemie Service recommends extending and complementing the HAZOP studies. HAZOP studies are aimed at serving companies that wish to protect themselves against risks – particularly companies in the chemical and process industries. However, the conventional method addresses the modern challenges of today only to a limited degree. TÜV SÜD Chemie Service recommends extending and complementing the HAZOP studies. Where process safety and risk analyses are concerned, the HAZOP study is the gold standard for identifying hidden risks. For decades, this ‘best-selling’ method has proved its worth in practice, in the planning, construction, operation and maintenance of complex plants. It provides organisations with a tool for a well-structured and systematic approach to identifying potential hazards and the resulting risks throughout the lifecycle of a plant. HAZOP stands for HAZard and Operability. The method revolves around a facilitated discussion with internal and external experts from various disciplines and departments, in which all production processes are subjected to close scrutiny. The process engineers, safety engineers, technicians etc. address safety-relevant aspects and possible solutions in depth and at all levels in a direct, face-to-face exchange. The discussion is ideal for developing customised concepts and significantly improving safety. The HAZOP study is based on the premise that incidents are triggered by unplanned deviations from target operational parameters. Given this, the method aims to find out which steps in the production process are particularly vulnerable to critical deviations and to determine the possible causes of said deviations. A set of guide words is applied to the target function and facilitates the identification of safety-relevant deviations. These guide words support a targeted and constructive discussion. Once possible deviations have been identified, the method specifies their possible causes based on proven technical potential for occurrence. The potential consequences of the deviations are assessed and discussed. When this has been done, the HAZOP team focuses on preventive actions that help to avert critical deviations or mitigate their consequences. In the last step of the HAZOP study, the experts document the identified malfunctions, causes, consequences and counter-measures in a report, together with their arguments and comments. The experience and the expertise of the HAZOP team members and the skills of the study leader are instrumental in the success of the HAZOP study. The study leader stimulates the creativity that is necessary to develop and examine various scenarios, and facilitates the discussion in a targeted and efficient manner. As the HAZOP technique can be used for analysis of technical and operational processes, but also for comparison against the state of the art and regulatory acts and standards, experts applying the method should also have in-depth knowledge and expertise in the field of standards, directives and laws (e.g. the German Ordinance on Industrial Safety and Health or the Air-Pollution Control Act). The HAZOP study has been used to assess hazards for roughly 40 years. 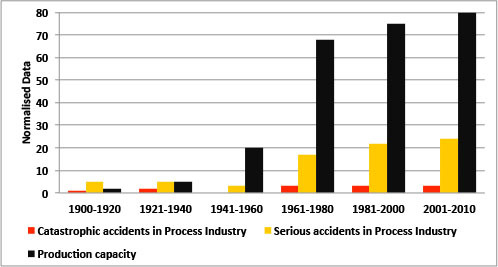 However, modern, increasingly complex production processes have given rise to new risks. They pose completely new challenges for the conventional HAZOP study, which largely focuses on qualitative risk assessment. On the basis of their experience and technical know-how and based on recognised codes, standards and applicable law, the experts judge whether a certain event must be classified as hazardous or not. However, increasingly short innovation cycles in fields such as materials and operating fluids or process control systems give rise to new risks, which can no longer be appropriately recorded by means of traditional methods. In these cases, experts cannot fall back on empirical information within the scope of analysis. It is in the nature of things that innovative procedures and the state of the art only become gradually reflected in standards and laws after they have become established in practice. However, sustainable methods for hazard analysis must also be able to meet these perpetual new challenges. An interpretation of Figure 1 supports this requirement by giving rise to the conclusion that the potential of the conventional method has been exhausted. According to this interpretation, the methods must be improved continuously and applied consistently to reduce the number of severe accidents. Experts and study leaders of TÜV SÜD Chemie Service have had good experience with the extended HAZOP study. The extended HAZOP study combines the HAZOP method with modern risk management tools. Using probabilistic and quantitative methods, the safety relevance of an event can be described on the basis of specific parameters. A comparison with evidence-based statistics, for example, enables the probability of occurrence and the consequences to be calculated. Using these methods, the experts can prepare statistical models of the plants and systems under analysis in which the failure probabilities of the individual components are set in relation to each other. The approach enables the failure probability for the entire plant or system to be determined. This probability and the possible consequences result in a risk rating. Comparison of the risk rating with the company-specific risk matrix reveals whether a risk can be tolerated, making it easier to develop and choose the right corrective actions as a low risk rating indicates the measures particularly suitable for risk minimisation.